Buzzwords like these remind us of our biggest dreams and goals to do something extraordinary—to blaze our own trail in the world. But what might actual trailblazing have to do with your organization? Well, more than you’d think. 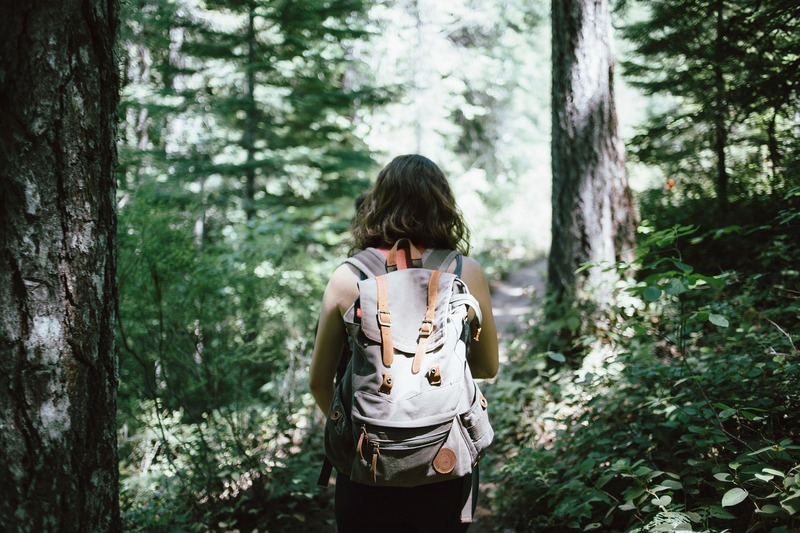 These five trailblazing tips from an off-trail hiking expert will change the way you think about navigating the changing landscape of your business, and help you to make informed, data-driven decisions as you pursue the summit. Okay, so “the one true north” might not exist in the business world. But there’s no question that creating a unified vision is critical to success. That said, identifying an ultimate goal is only part of the process, especially if that initial goal is vague or hard to measure. To break from the common mold, organization-wide standards and “landmarks” are a must. Establish where you’re starting, where you’re headed, and what milestones you expect to hit on the way, or else discover you’re wandering with no sense of direction or purpose. This means identifying which metrics matter most to your business, and setting weekly, monthly, and quarterly goals to track your progress. Use our free ebook guide to identify the crucial KPIs your business needs. Staying aware of your progress and position is as necessary in business as it is in off-trail hiking. 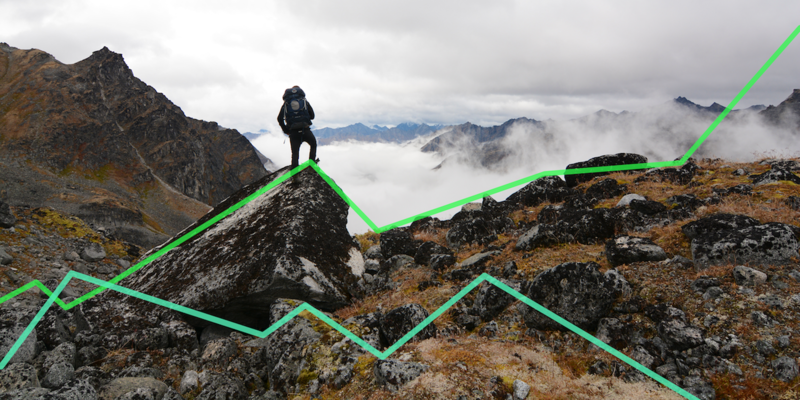 While hikers might use stars, compasses, and cairns to determine their location and direction, a business leader’s arsenal of tools are anchored by the guiding power of data. 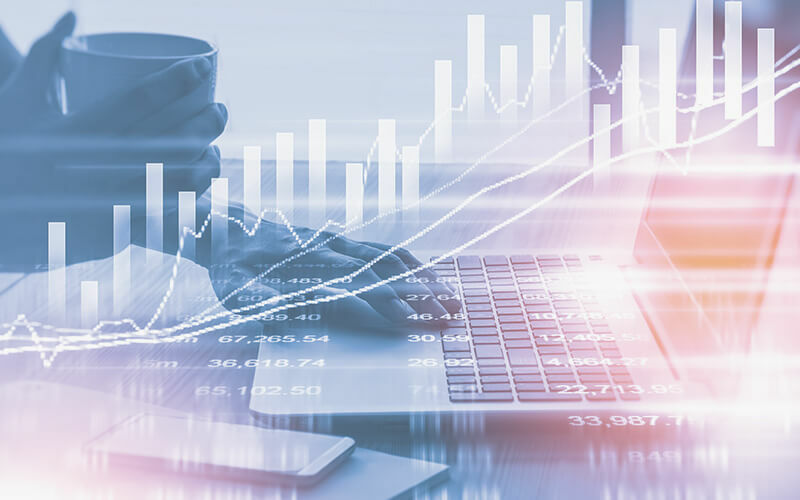 Big data can provide a wealth of metrics to monitor and accelerate growth, but as Tx Zhou has pointed out, the amount of available data is growing faster than ever before—which means it has a rapidly diminishing shelf-life before becoming obsolete. You wouldn’t make a decision about the next step of your hike based on where you were an hour ago—so why would you make critical business decisions based on yesterday’s or even last week’s data? Everyone loves a rags-to-riches story, and lessons learned from others’ experiences can be invaluable resources. Yet, however promising it may seem, mimicking others’ steps may not always be the best decision. Your organization is unique: your people, your product, and, yes, your problems, which means that your solutions should be uniquely tailored to fit your team’s needs. How? Instead of focusing on what was done, analyze why and how successful strategies worked, and apply those insights to your situation using your data and metrics to better predict results. 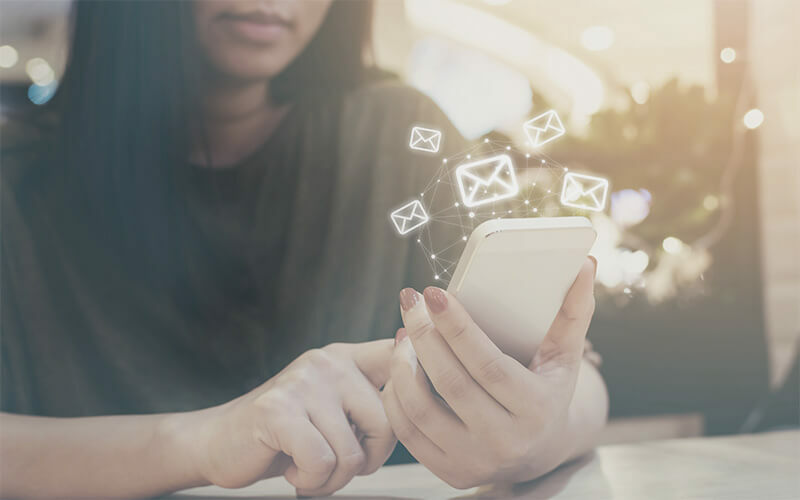 This nearly goes without saying—open and flowing communication lines keep everyone on the same page and ensure no one wanders too far off into the weeds. But keeping people together is only part of leading a successful team. A blind leader is a disaster waiting to happen, but blind followers wouldn’t be much fun either—just imagine trying to guide every hiker’s every footfall, around each sharp rock and over each patch of uneven terrain… Believe me, that way lies madness. And yet some managers choose to keep their data so close to the chest that they have few alternatives. Data transparency and knowledge sharing empowers team members to make informed, data-driven decisions in their own spheres, and spare leaders the pain of micromanaging. 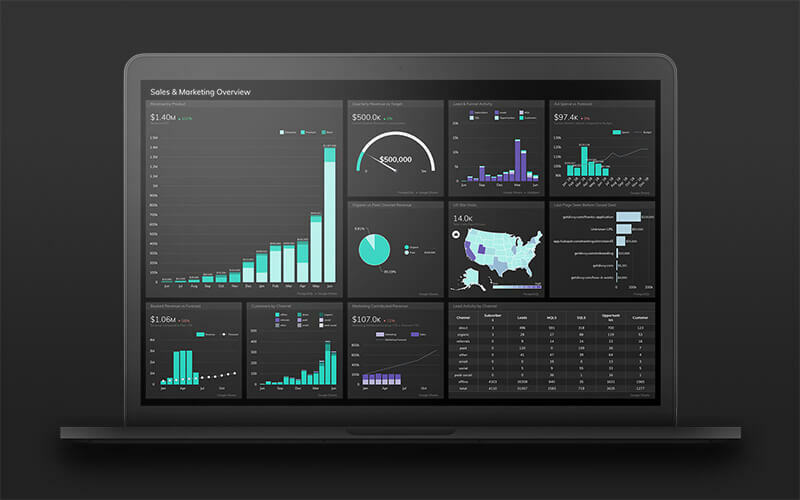 From robust marketing dashboards to concise executive dashboards, Grow dashboards are designed to be displayed, and we walk the walk: Come to our office, and you’ll find our own real-time data dashboards displayed so that our teams have continual access to the data that matters. We know from experience that the right data has power to increase engagement and propel results. It can be easy—even tempting—to make quick assumptions based on single data points and events. We’re only human, and gut-reactions can be strong. But a one-sided perspective is practically an invitation to biases which leave you vulnerable to bad insight. So instead of immediately following your first instinct, take a moment to consider several sources of information together to validate the story and get a better perspective. 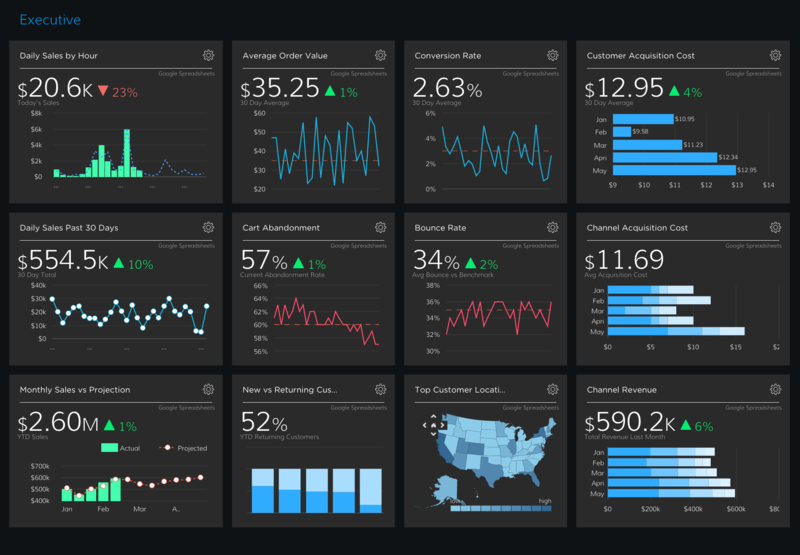 Better yet, merge multiple data sources in one metric on your business intelligence dashboard and see the full picture. In the world of data, “fast” is the new “big,” and having access to up-to-the-minute data will determine who pushes ahead of the curve, and who gets left behind. “Those who have the most relevant data in the quickest amount of time are those who are going to win,” says Tom Clark, CEO of Social Dental, “because you can make the fastest pivots, the fastest change.” Which means a tool that can put real-time, visual data analytics at your fingertips is invaluable to managing and accelerating growth. That’s where the Grow dashboard comes in. With Grow, your data is displayed in a real-time scoreboard, meaning that your team has constant access to your most valuable metrics and KPIs. Accountability is immediate, and issues can be addressed directly instead of stagnating until the next monthly Excel report is compiled. Growth can be seen and measured on a daily, even hourly, basis, so you can consistently stay on the leading edge. To learn more about the essential metrics that should guide your ecommerce decisions, download a free copy of our ebook, The Top 9 Metrics You Need to Grow Your Ecommerce Business today! *Note: These off-trail hiking tips were adapted from Philip Werner’s article, “53 Bushwhacking Tips for Off-Trail Navigation” on SectionHiker.com.